Being a girl in Survivalcraft is not only about different looks. Girls are smaller than men, have less health and cause less damage when melee attacking. But they move faster and require significantly less food to stay alive. Every skin has a different set of clothes they will spawn with. Some have better shoes but no hats, some have leather jerkins but no trousers, and so on. My TODO list for 2.1 has 16 items remaining. And I haven’t told you yet of survival enhancements coming in 2.1. This entry was written by Kaalus, posted on May 13, 2017 at 14:04, filed under Uncategorized. Bookmark the permalink. Follow any comments here with the RSS feed for this post. Post a comment or leave a trackback: Trackback URL. check out my Survival Craft Let’s Play Episode 2!!!! Ok. Staminus was very right. This is spam. I understand you want us to watch your videos, but weren’t those comments enough? The reason I have posted my texture more times is that the photo wasn’t working. So, what is your reason? If I wanted to watch your videos, the first comment would had been enough for me. However, after watching it, nice gameplay! That’s a good episode. I am waiting for more. But, on the second thought, if you are spamming this blog with your episodes, people will become tired of them, or will begin to hate them, and/or you and/or your channel. So if you want people to really watch and enjoy your videos, slow down a bit with your ads or stop spamming. Well upon posting the first comment. It didn’t seem to go through so I tried again. But then later they all Popped up at once. Sorry about the spam. I don’t mean to annoy anyone. If you did the same mistake as I did, no problem. Yay! I can’t wait for 2.1 update! I mean originally you could just choose a girl skin. She could always play girly anyway. P.S The skins are awesome! BTW, great to “see” you Again, and the decision to make females with different stats is an unusual, but excellent idea! Maybe some differences that involves accuracy with throwable/ranged weapons? Men should be able to throw spears farther, idk if there should be an accuracy difference. Nice, by how much do the genders vary. Are girls 5% faster, 10%? I don’t know what to say. I’m really mad but really happy, especially for the survival mechanic. I was so tempted to email you about why you need to come back, but thanks for returning on your own agenda. Makes sense. Do female characters have a shorter range for spears and other projectiles? Also, what about the community skins? How are those affected from the “spawn clothes”? I don’t think that affects that. You choose which person you want, and then have the option to change its skin. Or choose a body, customize the skin and choose a set of default clothes. I mean. The skins doesn’t apply to the clothing just the type of person that you choose. XD I hear a ‘That’s a bad stereotype about girls’ or something similar but to be truthful you don’t see many strong woman or bodybuilder woman. 2) The pants of the Male “black” guy, they looks like old pants, but they’re completely white and thicker? Are they new? Irl, women require less food, but have less strength, so are less able to hunt or fight. Its a trade off really, a contract between men and women. Men will do the bloody stuff, as long as women took care of the home and kids. In game, it will not be as drastic as in real life, which is fine. And it may just be like a different class, in an rpg. You miss the point. Brute strength aside, women can do everything men can but perhaps not following the same method. To relegate genders to specific roles is a construct of society, not due to inherent capabilities. Wall Street Journal in backwards? don’t call people putrid garbage. As always Kaalus your updates remain the highlight when I see them on the Play Store. Please help me with Windows. After the last Windows update (MS) my SC no longer works, on two PC’s. I think I’m sticking with the old guy, I like him the most. But can you give us a sneak peak of the ui that allows us to select which one we want? This has nothing to so with being racist and more akin to racial features like orc, elves, and dwarves… but I agree, this can be construed as rasicsm to the ignorant. I agree you. This is racism. Also see #6. How will you equalize this balance? Just a question: how do you want Kaalus to add cancer in the game? Can please you give me more details about it? I want to imagine it working to see if it’s a good idea. I personally don’t think this will be good for a survival-themed game, but cancer it’s a quite creative idea. You are opening a can of worms. Great to see the work you have done. I know Bruce Jenner thinks himself to be a woman, but he still is and has a man’s body shape. Your females could do with a little change of body shape to make the frame look more feminine. what survival enhancements do you think kaalus has added? Maybe rotten eggs. It can be poisoning. I’m guessing that when you run out of stamina and u keep panting so hard, ur character will faint. Kaalus. There is this one problem with the character and that is if you walk left while facing forward in first person, he’ll keep looking at that direction in first person but in third person my guy is facing left. A bug is if you keep spamming jump you’ll waste more stamina even if you only jumped three times. One more bug is if I sleep in a tree then I press the sleep button, the Whole tree vanishes. Good game though. I don’t think I could make a game that great 👍. I mean don’t be mean to people. we wre all created in god’s own image. I was wondering it you could make the community uploading easier or maybe put in a in game recording (kind up like the in game screen shots) in the next update. Or could you make a tutorial for community uploading on your channel. Discovered by me. I named it the phantom glitch. Wow kaalus your one of the few game developers brave enough to give different stats to male and female characters, congratulations. I think there is a big glitch in survival. The Hit and Run backwards strategy. It is very easy to kill a bear. There should be a mechanisme which weakens this strategy. For example it could be interesting if the player would automatically slow down when performing an attack. Actually it would be more realistic if bears automatically fought each other. IRL, they do NOT allow other bears around them, except during mating, and their own children. They would never defend another bear. It would be more realistic if they didn’t approach each other. I agree, making the player slower when he attacks would be a good idea. Maybe increase all damage a bit to compensate. I think it should be optional in every game mode. Fighting would get very hard so of course everyone have to be able to choose. But I would like the feeling that you have to avoid melee fights (Or to use nice strategies). Well, cruel mode isnt actually much harder than challenging. And challenging isnt really a challenge. Has nobody else had trouble in Windows 10? SC2 is now unplayable. You can begin a game, but it is not saved. You cannot even quit from the game, you have to end the task. I have this now on two different PC’s with different hardware. I think this is after the latest Windows update. It actually works a lot better than on my phone. I have the Android version as well and I prefer using my keyboard and mouse by far. In the beginning I actually complained, but now I don’t want to go back to my phone. The big screen is also nice and performance is so much better. Electronics or other movements like furniture and pistons can slow down the phone a lot, while the PC just gallops along. Windows is a horrible os. Always has been. Are you sure you weren’t one of the millions of windows users who were just hacked? He already responded and will look into it. In the mean time I’ll have to be satisfied with Android. Playing with a keyboard and mouse is much better though. Ah he lives. And still going with the survival enhancements? Should help ease some of the lefora goers. Hi everyone! I just started a YouTube channel and I’m planning on creating great content! So if you get the chance please check it out! You already said that. And how about stating one somewhere that doesn’t force us to watch a whole bunch of stupid ads? Or are you hoping to make money from us??? I won’t watch squat on youtub – I can’t stand all the ads using up my download data and google (youtube) stealing my phone data! I know I already said that, just trying to get my channel out there! I’m not doing this to make money of off anyone. I’m doing it for your guys entertainment! My videos should not have any ads on them. How do I upload stuff to Community Content? I want the new icons too. And a list of IDs! Hi guys! I just started a new YouTube channel! I plan on creating great content for Survival Craft 2! If you get the chance or are interested check it out! A wiki is a REFERENCE for facts. It is NOT a discussion forum. It is NOT social media. It is NOT a place to whine about what people want. It is NOT about guesswork. It IS for FACTS and INFORMATION. So, are you the one who I just permanently blocked for swearing on the wiki? And now you’re swearing here? I’d email the maker of the game, listed on the sidebar. He’s usually good about responding to bugs. I have put signboards containing info about various parts of this glitch. This is a hacked world, NOT a glitch. One quick look at the project file proves this is FAKE NEWS! how about some mechanics that make food items go bad after some time? like in real life? and consumption of rotten foods causes problems to player? I have been following SC for a good 4 years now, and the temptation to stockpile huge amounts of food is always there. adding the food decay would make food stocking more distributed over time. and since we’re on the food rotting part, how about an ice chest? break ice to form ice cubes, add to ice chest, extend storage life of food in chest? But think of survivalists when adding the elephant… Are you sure you want something that kills you with one hit even if you are in Harmless? However, more tree types will be a good idea if Kaalus shouldn’t make their biomes before adding. I personally want more updates with something useful, instead of one update with trees. I’ve already said that more tree types will be a good idea, but I still think Kaalus can use the time for working on something more useful than trees. However, I don’t say more tree types is not useful. He actually planned on adding elephants, but the trunk gave him problems. Hey guys! Just uploaded my first Survival Craft Let’s Play! Take a look! Hi Guys! I just uploaded my very first Survival Craft Let’s Play! Please check it out and enjoy! Thank you Kaalus! Btw please check out my own blog! Hi Kaalus, I was wondering you were ever planning on adding animal breeding? I don’t mean on your current to do list or anything but as something you would like to add to the game at some point in time. I got an idea for melee damage for females. For example, let’s imagine with the diamond tip spear, males would do 7 damage melee while females would do 7 damage melee. I think ranged power would be same for females and males (9). Note: This is just an example of melee damage differences. Is this amount of damage for that weapon required? No. This is a scenario. 9 for melee for males* the 7 for males is a typo. 9 melee damage of diamond tip spear for males and 7 melee damage of diamond tip spear for females. Again, this change is optional. It is just a scenario. Realistically the range and force that a woman (on average) would be less than a dude’s, but for programming purposes i don’t care, because the damage of throwables would have to be separated from normal projectile damage. Again, I think the new survival machanic for 2.1 is poisoning. Damn guys i can t reinstall sc2 for an error code after the ripristine of my windows phone,what i have to do?another ripristine? Survivalcraft on Nintendo Switch PLEASE!!! (P.S. Minecraft is already on Nintendo Switch!) Survivalcraft is a great game (if not the BEST), and I want to play it on my Nintendo devices! Yes I agree. I would love to have it on the Switch. You’d have console (big screen), portable (portable), and larger viewing distance than mobile. Please Kaalus, Nintendo seems to be allowing a lot of indie titles on the Switch, meaning they want a lot of third party support. I’m sure you could get SurvivalCraft on there easy! You could probably get away with charging more too. Do you have an estimate of when SurvivalCraft 2.1 may be coming out? 1 month? 6 months? -New, fresh look: Almost changed the whole texture during the last update! -Build in style: Changed most of the construction blocks! -Better grass: Not so realistic, but modern and perfect for a video game! Contact me here if you want me to change something, or you found something that looks odd. Hi there. Just try to remember to give some credit to previous designers. It is just good manners. As you can see, I have done so in this very texture which you got from me, which is OK by the way. I’m glad if you like my textures and am not offended. It is just nice to give credit to those who have gone before you, even though it is OK with me. If you need some help with other textures, feel free to ask as well. 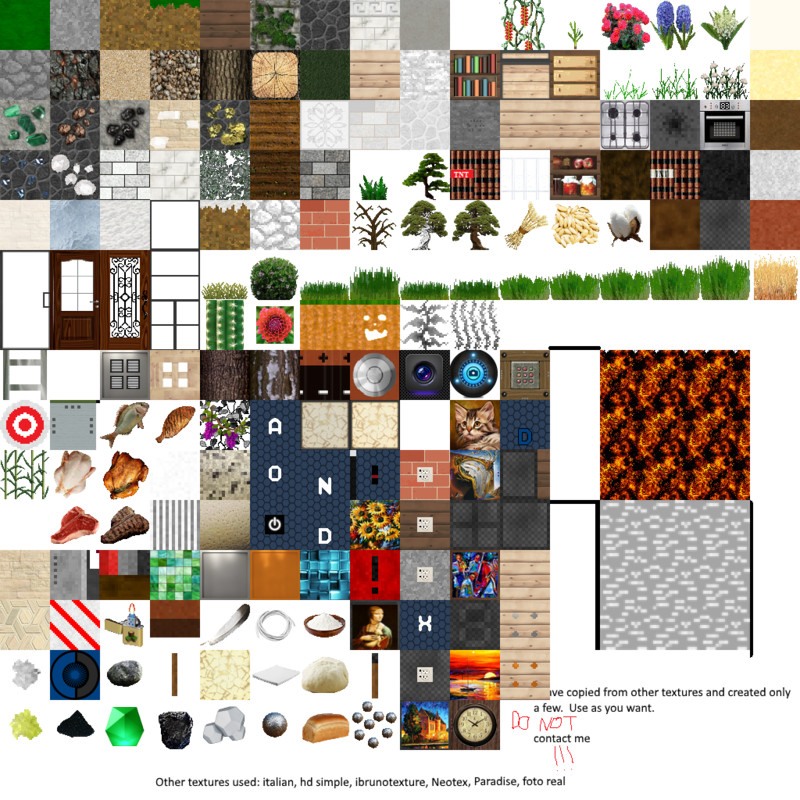 I have made many of these textures from the ground up, like the trees and ores. I have modified some others like the oven. I see you have modified some as well. They look good. Not a bad combination. I see you also like realism. Lately I only use your texture. I noticed right away that this was heavily based on your texture. Sad to see people being so derivative of others hard work and no mention of you as the originator. I don’t think I have any use for the cat picture. (?). Only good thing I can say is saltpeter will be easier to see as ore and as mined byproduct. I have apologized, but I still think this wouldn’t fix how Johan felt… Regarding to the pictures, they were added before furniture. This is now the second thing on my list. I am going to change the pictures back into electrical components. I was returning to SC after a break, so I prepared a fast update that changed and fixed most of testures. Too much to do for a fast update… I had no time for electrical components. Again, I can’t tell you and Johan how “sad to see me being so derivative of others hard work” I am and I will mention Johan “as the originator.”. Don’t worry, I am not narcissistic. Look at my Johan Survival texture pack. There I have gone back to normal electrical components (from iBrun I think) as well as a few other changes. I have also changed limestone on both because I got tired of the leafy one. I was also thinking of changing the coloured glass one, but got no complaints. I have also changed the cactus flower because someone did not like it. The oven is also changed, which suits survival a bit better. Look at my limestone, it was a new texture I have created. The tree textures took quite a bit of work. I have made new HD seagrass and kelp textures, but they are also quite tricky. The reason I have not removed the coloured glass yet, was that I’m waiting for painted glass. Btw I copied the flowers from the previous guys. No need to change. Something that might be useful is to change the ores into something completely different. My cokours (especially johan colours 3) texture packs have changed all the ores to new coloured (clay painted) blocks. Just an idea, you can make anything from them. I also want to find plants that are realistic, not real. For example, the grass I used it’s not real or realistic, but it looks good in a video game instead. Painted glass will be very nice. But I am not going to change the ores. I want my texture to be universal. You are very right when you say that I could do something useful with ores. But I can’t imagine how will this look in survival. Maybe I’ll realease a creative texture one day, but for now I want ores to be ores. I have just downloaded your newest textures. The new textures look really good. The only thing I don’t like is the Jack o’lantern. The texture doesn’t match the pumpkin. I’ll remix it and I’ll send it to you via e-mail. You can change it if you want, but you are not forced to do it. No hard feelings at all. I was just pointing out good manners, not meaning to “punish” you. Does anyone know how to post pictures directly? Upload it to dropbox, then share it and copy the link. Change the 0 at the end tp 1 and it will display. ….but it didn’t work. Thanks anyway! Where is your problem? Post your link then I can see what is wrong. Do you know how to get the link to your picture? Sorry again, but what did not work? Could you not upload the picture? Could you not copy? Thank you very much, beacause it worked after moderation. Modern Realistic Textura Pro UPDATED! -New, fresh style: Almost changed all of the texture during the last update! -Beautiful builds: Changed most of the building blocks! -New grass: Not so realistic, but modern and great for a video game! -Fixes: Fixed glass, Jack o’lantern, cell(glass)door, and iron fences! You can contact me here for any request. Don’t forget to rate! OK, you got it right. The reason it does not work right away, is that Kaalus first moderates it, or maybe it is WordPress. So it takes a while before it displays. It worked… now the problem is, how I did it to work?! I hope, one of the 16 remaining items is the NPC or something like this. Clever giving all the girls short hair. Its gd idea male and female characters,how about adding a bag to carry more stuffs,cure the wounds,the 4 seasons,real rain,and more cool ideas. Even in Minecraft this happens. How must the software realize which part is the inside and which part is outside the fence? The mechanism used by most block games, is light, but only for predators as far as I know. There are a few ways to stop random spawns, since lighting plays no part of it in SC. One is to stop spawns in any modified chunk. This would make it too easy to change every chunk around your house and never have to deal with animals. Another is to only spawn on natural ground materials. I actually suspect the game uses this mechanism but haven’t quite proven it yet. A third is to not spawn on any block not at the generated height level. This might be too cumbersome for the game since it would have to recompute the generation for every block an animal might spawn on. In any case, animals can spawn elsewhere as they do, and follow your scent to get to you. Stanimus, I did a test that proved your theory – animals spawn only on natural materials (see last post). I think I wrote “16×16 square” but I meant “15×15” by the way. I like the season idea. It should be implemented depending on biomes. Found a very frustrating bug: if you fall between a fence/wall connected with a block it will glitch you, and if you break the connected block and touch the ground you will instantly die of fall damage. Rainbows cause those are very useful. Poison cause we got to kill ya faster. Multiplayer, so we can kill each other. Orange colors so we can see each other better. Sleep animation that makes you appear dead. So we might get the 2.1 update sometime in late 2018. Wait……. Can you make those humans behave more like herds of cattle? Please put it in the next update, im sure lots of players would be happy too! I know it might be aong shot but im hoping you would put humans on your next post! Hi, I am new here I have been following this blog a while and I think it’s time for me to join in. Anyway, here’s the features I want to see in the future. – Seashells: Now that we have starfish and urchin which doesn’t move or anything. I think it’s perfectly okay to include them in the same category. -Fruits/Vegetables: Because I don’t think you can survive in the wild by just eating meat, pumpkin and eggs. We need more healthy food. -Bees: They are very important, they can produce honey that can be edible and can be used for medicine for survival. -Fishing rod: Need I to say more? -Taming: We could tame wolves and coyotes as dogs. And others like cattle, ostrich and boar to become livestocks. -Breeding: I need to make an leather/fur farm. -Free movement animasjon: As soon we get in the deep water, you could animate the character like it’s swimming. -More warm clothing: Again, do I need to say anything? -Sinking mud: A challenging feature for survival players. -Ability to heal your horses. -Make the day last longer. Now, there are biomes, where the season stays in one state forever. For example in taiga biome is autumn/winter forever. And if you hate winter, you can evade. In winter, there could be snowstorm, and simple snowfall. In spring, could be heavy rain and the trees get leaves. In summer, could be storm, heavy rain, thunderstorm, simple rain. In autumn, could be simple rain, the trees (except spruce) drop off leaves (disappear, because the game will be lag because of the lot of pickable stuff). And the animals. The polarbear spawn only in winter, for example. In winter, the waters (lakes, small rivers, and the edge of the sea/ocean) will freeze. The crop will freeze in winter, so you can’t eat/use. PS: Sorry for language mistakes, sometimes i use google translate (hungarian to english). That’s a good idea. When I play in challenging, I often can’t decide if to plant, mine, explore or hunt. With seasons, farming will be one less thing to care of. The plants will grow depending on the seasons, allowing you to plant once in spring, and harvest only when the summer comes. I would mine or build in winter, beacause I coludn’t go outside. Thats great! And also double’s the chance of us capturing more white tigers! I don’t think anyone actually understands. Kaalus is NOT OUT OF IDEAS. The slow development isn’t because he doesn’t have enough things to do, it’s because he’s a one man crew with hundreds of various bugs to fix, code to code, things to add, etc. You don’t need to keep on giving “amazing new ideas” because Kaalus probably already thought of it. If you are going to give a suggestion make sure it’s: relatively easy and quick to implement, matches the theme of the game, will make people happy, and most importantly is ORIGINAL. Thanks. I personally haven’t said Kaalus is out of ideas. I am also a proggramer, so I know why the updates come so slow. Thanks too. I don’t know what happened to me in that moment. Or some other kinds of boss mob, because it would make the game more challenging, and a chance to hunt it down with other players once multiplayer comes up! I’d be fine with an elephant that is like a rhino until you break it, then you can ride it. But it would be naturally spawning, no rituals or anything to get it to appear. But maybe it would be like a white bull, far back in the mainland. How about you guys? 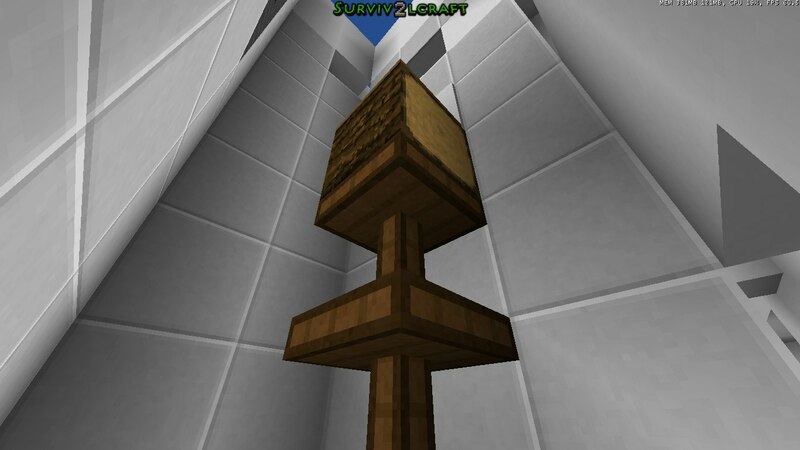 Whats your idea for a boss on survivalcraft? i thought maybe the current default character spawning also with a sweater. I find so many wolves and birds on my world.